This book examines the principles and practice of authentic assessment. It seeks to answer the following questions. What is authentic assessment? How is authentic assessment different from 'performance assessment' or 'alternative assessment'? How can authentic assessment support learner-centred education, especially when a performance-oriented culture favours pen-and-paper examinations? The book is structured into two major parts. The first, 'Principles of authentic assessment design', provides readers with a conceptual explanation of authenticity; the principles for designing quality authentic assessments for valid evidence of student learning; and guidance about how to develop quality rubrics to structure assessment tasks. The second part of the book, 'Theory into practice' provides examples developed by teachers to demonstrate an understanding of authentic assessment. The subject areas covered include humanities, languages, mathematics, sciences, character and citizenship. Two case studies are discussed to demonstrate how authentic assessment can be used to comprehensively address key learning objectives in a variety of curriculum contexts. This book provides practitioners with concrete examples on how to develop authentic assessment to suit their context and also enhance their students’ learning. The book will also enable teachers to face assessment challenges present in our changing world. 'Authentic assessment is assessment that mirrors what it is in the real world we want students to learn. We want students to enact performances that show they have understood and can use what we have taught them at an acceptable level. Just telling us back what we have taught them – typical assessment practice fr a long time – just doesn’t cut it. The practical issues are: to make clear what outcomes we want students to achieve, to design tasks that mirror those outcomes, and to be able to judge what an acceptable level of performance or of understanding is. 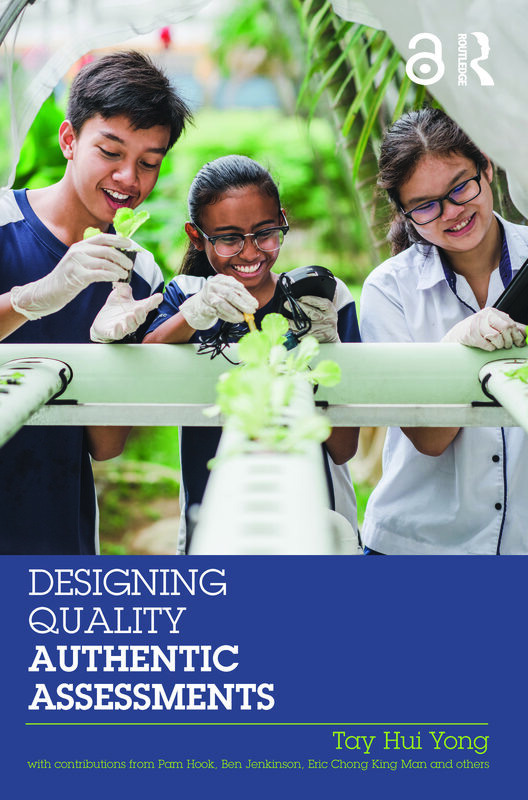 Thus book is in two parts: the principles of authentic assessment design and their application to a wide range of school subjects. 1. What is “authenticity” in AA? 2. Why bother with “authenticity” in assessments? 3. How do you design quality AA? 5. What is the place of AA in 21st Century Competencies? Tay Hui Yong is Senior Lecturer with the Curriculum, Teaching and Learning Academic Group at the National Institute of Education, Nanyang Technological University, Singapore. She has previously served in secondary schools as a teacher, a head of department, the dean of curriculum and as vice principal. Currently, she teaches courses to a wide range of learners in her areas of expertise, particularly authentic assessment and self-regulated learning. She has published on other areas of assessments e.g., use of technology. Above all, she is interested in all things that will enhance a student’s learning experience in school. Assessment in Schools: Principles in Practice offers a collection of titles that provide accessible exploration of individual assessment concepts, while collectively providing a comprehensive overview and discussion of assessment practices in schools. This research-informed and practice-oriented book series aims to make assessment theory accessible by explaining its implications and applications in practice, providing guidance on designing and implementing quality assessment practices, and giving authentic examples from current practices. • Formative assessments practice as part of an effective teaching and learning process.